I reckon looking at the seat yours was a 125. 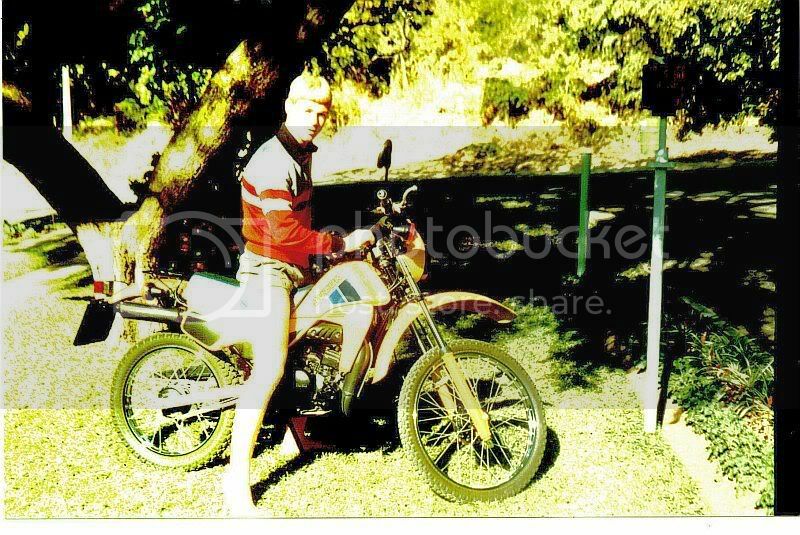 [/quote]Thanks for the pics,it must be a 125cc, do you know the make of the motor? The red frame also look interesting, fit the bike and the whole 60's 70's idea. The tank i think is also orig. it wont take a lot of fuel,won't go to far. The 1 front light, rear light bracket,frame,wheels,seat(whithout steel inlay),i think is still orig. Front light like this (50cc)? cC.jpg[/img]Motors were Minarelli I think Great info, thanks, even the mudguards and the steel inlay saddle,(pattern) is the same. Patman - these pics is of your bikes twin brother. My parents swear it's me. On a brand spanking new Suzuki TS50. Delivered newspapers for three years to buy the bike. Blerrie grand bike JM, i had the same one, also yellow, I just loved that bike. 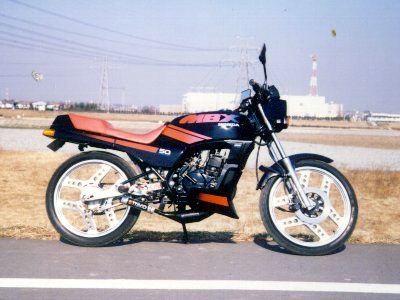 My first KTM - was about 1986. Monster power with almost no brakes. IT 465 - around 1987. Also taken in the empty Beaufort West dam. That dam broke a lot of bones in the 80's. It's is still in everyday on our farm. not much left of the plastics. Bought at Woodstock dealer for around R 1100-00.Think it was Hausberger Yamaha. My father nearly got a heartattack when he saw how his son "treated" the bike. Ja, thats me on the AJS, ek het skoeters stukkend gesmaak van kleins af. Yip, there she is...still riding today. Ry so nou en dan bietjie met hom...hier is nog een voor die "rebuild"
sien ek nou eers die thread..
ek leer ry toe op n kx65 - erens op n plaas n beaufort wes. ek was gese ek mag nie gears change nie , omdat die ding te vinnig is. lank rond geploeter toe ondek ek 2de en 3de rat. anyways toe kry ek n Honda C90 3speed automatic.. i loved the bike till the petrol tube corroded and the bike never started again. Toe kry ek n MBX50 - ek was 13. Bosson exhuast .... ek was die miskiet op Riebeek wes. Many times i was pulled off for riding without that thing they called a license and i was always instructed..
stoot hom huistoe ... LOL ya right! then it seized .. and i sold it. got a Suzuki GT200 2 smoke... Rode it like i stole it... 1st bike i had that did 160kph - That things Rpm's ran at through the red @ 3 o clock and ended up at 7 most the time . YAMAHA DT/AG175. bought it for 3000 and the very same day the chain snapped and bent the clutch pin. sorted that out and got a flat tire. then the clutch cable snapped. ai it was a bad luck bike. then after that i got to the superbike market ... and splashed alot of money on crotch rockets. 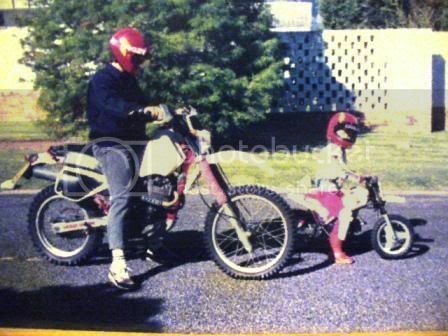 untill i found dirt a couple of years ago..
Me on my Yammie 600 TT and my son on his Yammie 50. Check the similar colour schemes. My son rode this bike a while, but decided that he like surfing more. Don't worry, be happy ! Don't take yourself so seriously !! 2 x FS1, 200Roadmaster, 400Hawk, XL500R, XS750, XR500R, 600TT, CX500, 1150GS, R1100RS, R1100GS, R1200S, R1200RT, 1150GS (2), K100, R1100S & 35 Cages !! Yup, it was fun to do the bike thing together. When my son took to surfing we did that together and had lots of fun. Since he left home, I now reverted back to my first love, bikes !! Here are some of my XT 500 & XR 500 pick's. Here it is after installing the enjin. Here are a few of the XR 500 the before and after. Page created in 0.314 seconds with 26 queries.